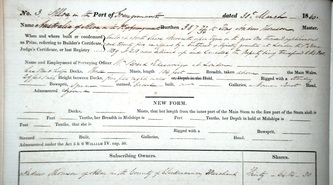 The images below is from the Alloa register of shipping 1838 - 1855. The Merchant Shipping Act of 1786 required the owners of any British ship with a deck exceeding a 15 ton burden to register it with the Crown Customs in its home port to enable the government to have a regulatory control over the vessel. The resulting series of records give a fascinating account of ships and their owners. This particular example gives details of the vessel Australia of Alloa, built in Newcastle Upon Tyne. 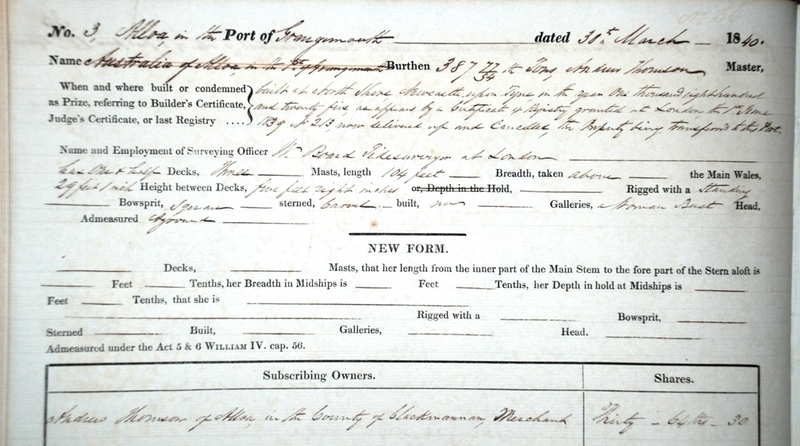 The registration of the ship was on 30th March 1840 and it gives comprehensive details of the ship and its construction including the length of the three masts, the one and a half decks and a figurehead described as a 'roman bust' on the prow. The registration was temporarily cancelled when the Australia was abandoned, water-logged, on the coast of Newfoundland on the 22nd December 1840. This was evidently a temporary setback as the vessel was back in service by the next year with William Kinnear recorded as the new Master on 9th April 1841.